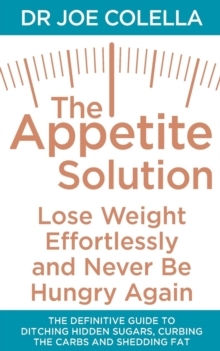 The Appetite Solution is weight loss expert Dr Joseph J.
Colella's aggressive six-week, three-phase plan to help you jam 'false' hunger signals, diminish cravings and achieve your goal weight - breaking free of the carbohydrate addiction that packed on those difficult-to-shed pounds. Dr Colella examines the reasons why we feel so hungry and dismisses the diet myths that have recently been endorsed. He reveals how the 'sugar free', 'juice' and 'alkaline' diets that supposedly promote weight loss are actually loaded with hidden simple sugars that create cravings and lead to over eating. Instead, Colella proves to readers that the key to permanent weight loss is eating complex sugars and the right amount of protein. He introduces a simple and practical three stage plan that increases satiety and curbs your carbohydrate intake resulting in sustained weight loss:Phase One: Up the protein Phase Two: Lower Simple Sugars and begin moderate resistance exercise Phase Three: Shed the Fat The Appetite Solution launches you on a journey that is forever free from an excessive appetite, creating a healthy metabolism and bringing your weight under control permanently.